Nintendo today introduced new bundles and even a new controller to get the market warmed up for the holidays. The new bundles will be available since November 7 and will include a Wii with New Super Mario Bros and a Wiimote that has Motion Plus attachment built in. 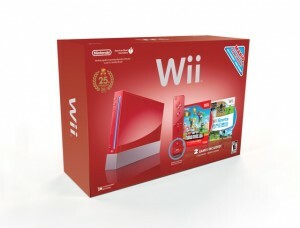 Wii also introduced a Red Wii Bundle which is a limited-edition Wii hardware which celebrates the 25th anniversary of the Super Mario Bros. game. It will be available for just $199.99. No price change considering the limited edition. Wii also introduced a Red Nintendo DSi XL bundle which also honors the 25th anniversary of Super Mario Bros with its iconic themed graphics. It is available at a suggested retail price of just $179.99. With the holiday season fast approaching, console makers are set to drop prices for their gaming consoles and fight the competition with bundles. Previous New Games announced for Kinect!